Spiti, formerly known as ‘Piti’ means ‘the middle land’. Nestled between the regions of Kinnaur, Bushahr, Kullu, Lahaul, Ladakh and Tibet, Spiti is the middle land connecting all the major regions. The land of high mountains and deep valleys, Spiti is known for its magnanimous beauty, kind people, Buddhist culture and heritage. Located in the Trans-Himalayan region of Himalayas, Spiti starts at an elevation of 3000m above MSL. Scant precipitation makes Spiti a high-altitude desert with extremely scarce vegetation over most of its area. Natural vegetation mainly occurs along water courses and on high altitude areas that receive more snow and cooler summer temperatures. Human settlements, however, are richly vegetated due to irrigation. For centuries these remote valleys lived largely isolated from one another, preserving homogenous and distinct cultures and traditions. To this day, from one valley to the next people speak completely different languages and within the same valley up to 7 dialects may be spoken. The valleys of the Himalayas hold the treasures and secrets of ancient civilizations. Monastic traditions developed enormous architectural marvels and perhaps in no other society does religion play such a defining role in the political and economic development of the region. Desolate, high altitude deserts support monastery-cities perched precariously on sheer cliff faces. These fascinating edifices are a display of the rich cultures completely indigenous to the high valleys. Spiti is home to several ancient monasteries dating to 980AD. 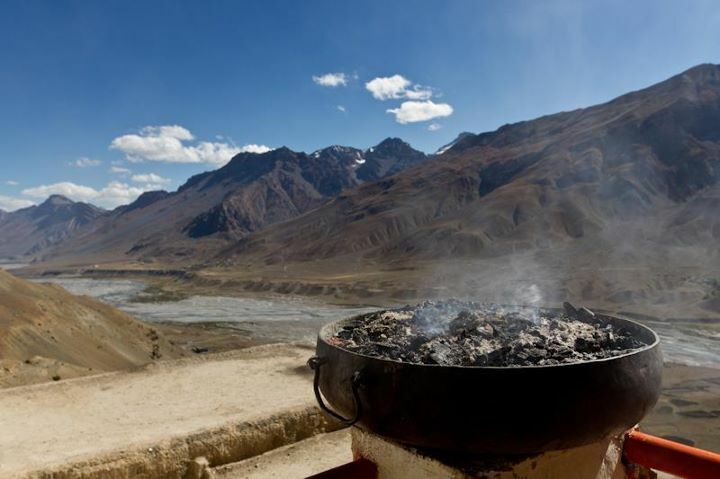 Spiti has always drawn wanderers and explorers with its rich cultural heritage and spiritual prosperity. Increasingly, it has been the spiritual appeal of Himalayan Buddhism which has drawn western travelers to the mountains. Indeed, it is often said the Himalayas are the closest humankind get to the heavens and the Hindu, Buddhist, Sikh and Jain faiths can all trace roots to these mountains.